Have you ever scrolled through Instagram or social media in general and wonder why everyone’s photos and lives just seem so perfect? 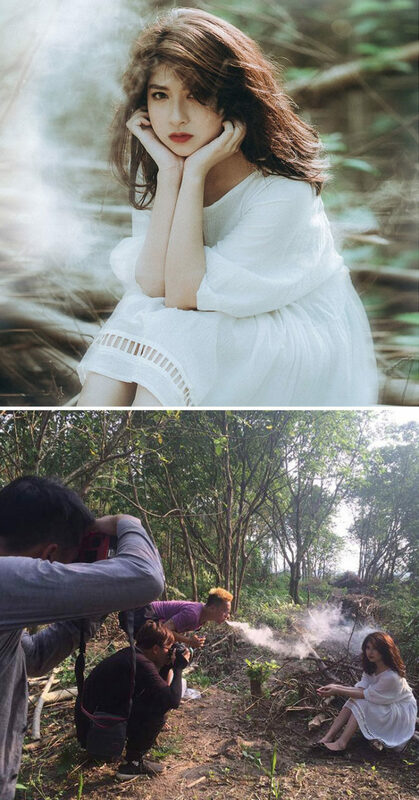 Well, behind every ‘perfect’ photo is a photographer who will go to the end of the world to get that killer shot. 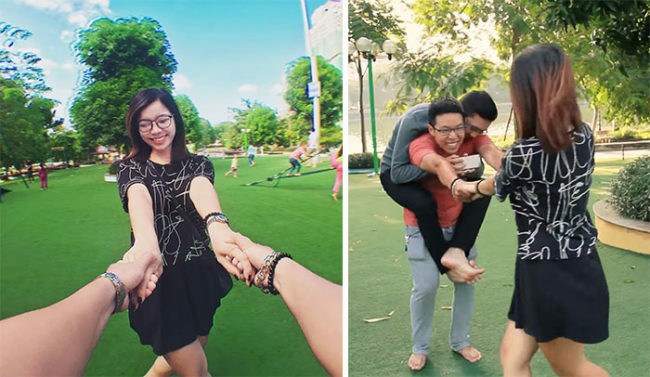 You will be shocked at what these photos actually look like in real life behind the camera. It might also help you feel just that bit better about your own life. 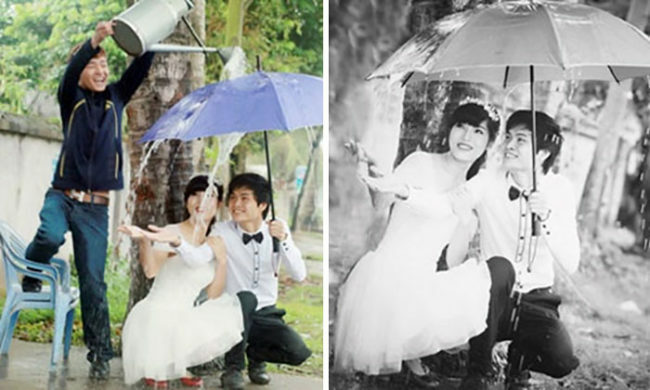 This is a beautiful photo with beautiful drops of rain or champagne raining down over the happy couple. 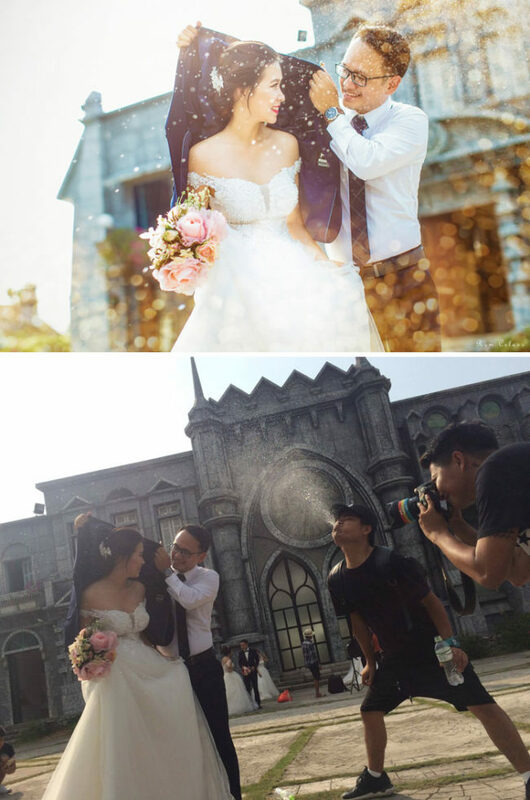 Nope, it’s just some random dude spitting water out of his mouth while the photographer snaps the perfect shot. Don’t believe what you see, folks! Perspective makes a HUGE difference, folks! This looks like some shot from the 50s but really, it’s just some toy cars. 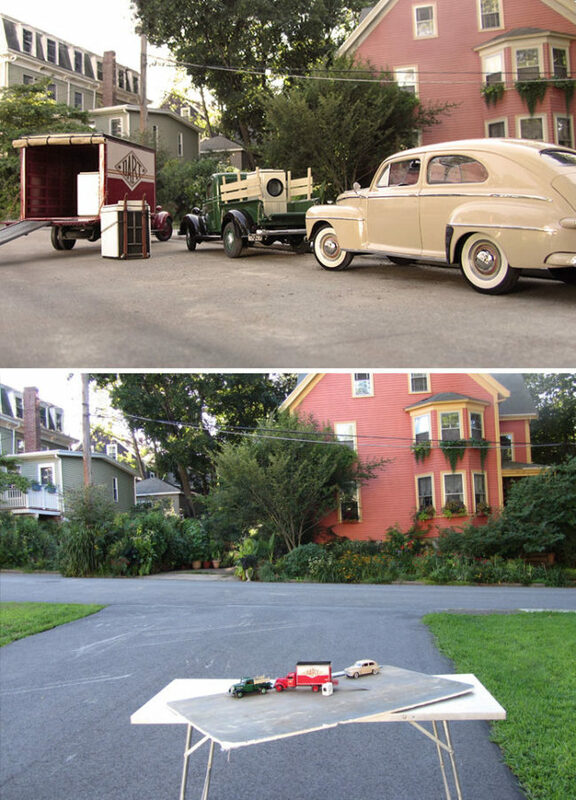 This photographer could have had us fooled that this is a film set! Looks like a beautiful photo in nature, right? Wrong! 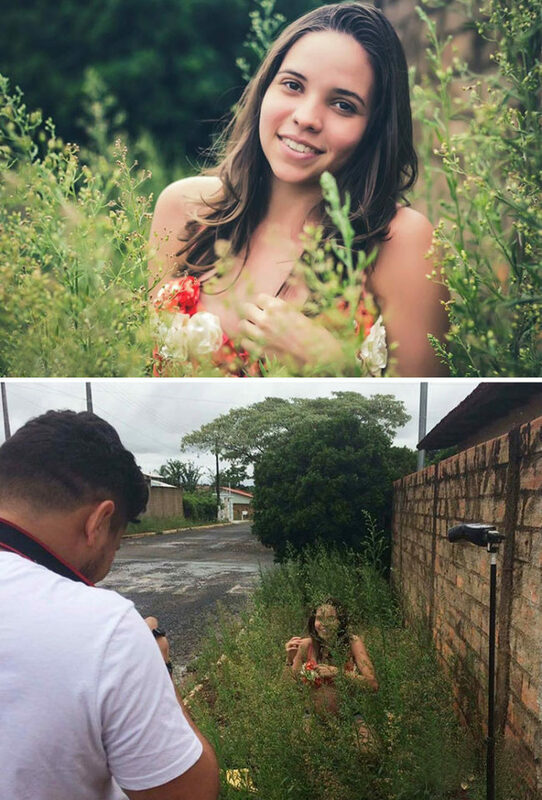 It’s just a girl posing with some weeds to get that awesome Instagram shot. The lengths some people go to! 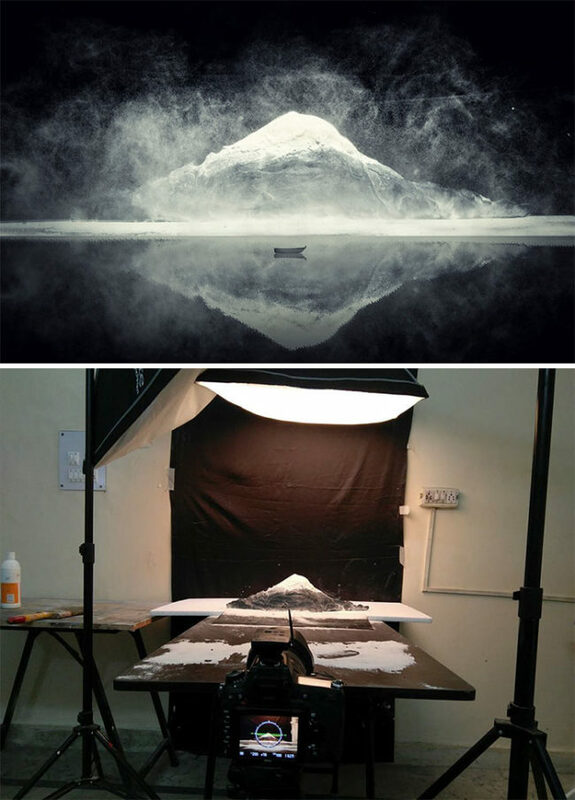 I always wondered HOW people got pictures like this and now I know! Kind of takes away from the cute, romantic aspect though. No, these people are not risking their lives hanging off a cliff, it’s just a rock with a cool backdrop. It’s clearly a popular Instagram spot though, seeing all the people queuing up. Humans are weird, man. Nothing like a bit of vape smoke to add some dramatic effects to your Instagram posts. My question is, how on Earth do these people keep a straight face whilst someone is blowing vape smoke or water into their face?! Now I know every food company is lying to us in advertising, I KNEW McDonald’s never looked that good in person. Still tastes good though. 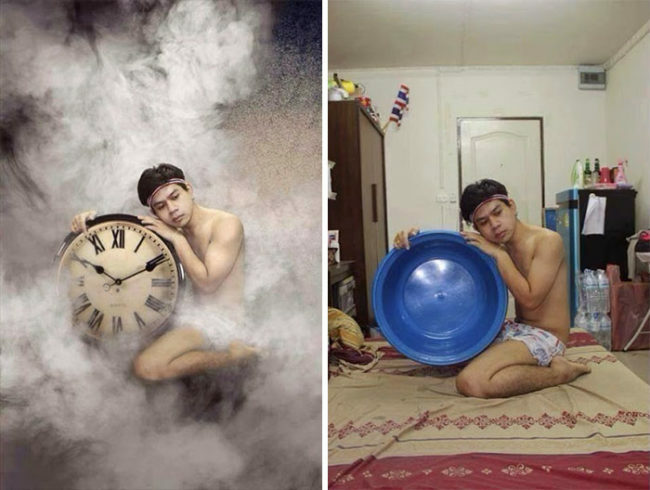 The reality of this picture is not quite as magical but that’s some impressive photoshop skills! 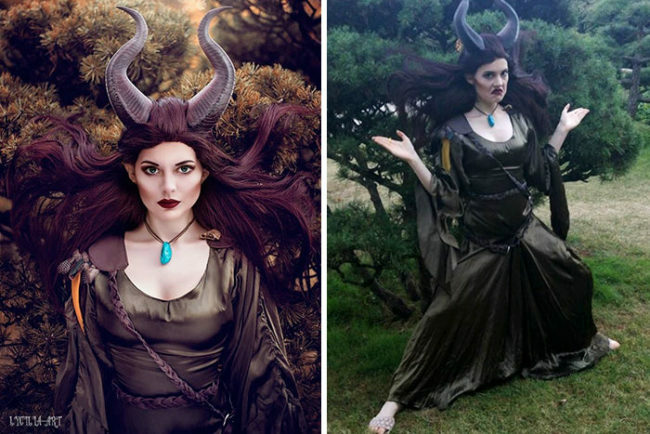 People put A LOT of effort into these photos. I never knew this and I am shocked. It’s no longer quite as cool as it looks but it is certainly pretty impressive! I could never have the patience to be a photographer. 10.) What’s up with the bare legs?! This one is hilarious. He looks so majestic but he’s actually stood in a studio with he bare legs out. Don’t trust anything you see! This is shocking, I would have no idea that this wasn’t actually Paris. I might just pretend I’ve been on holiday to loads of exciting places using photo backdrops. 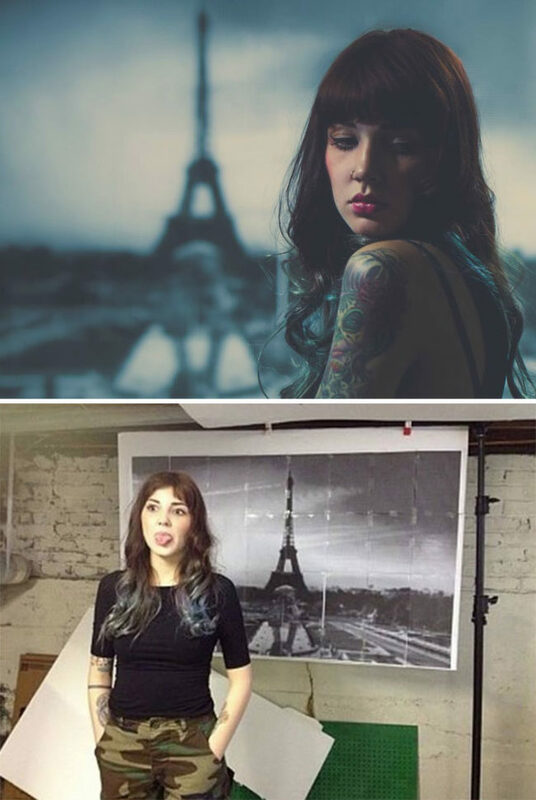 Her face is like, “Look at what I had to do for a decent photo”. 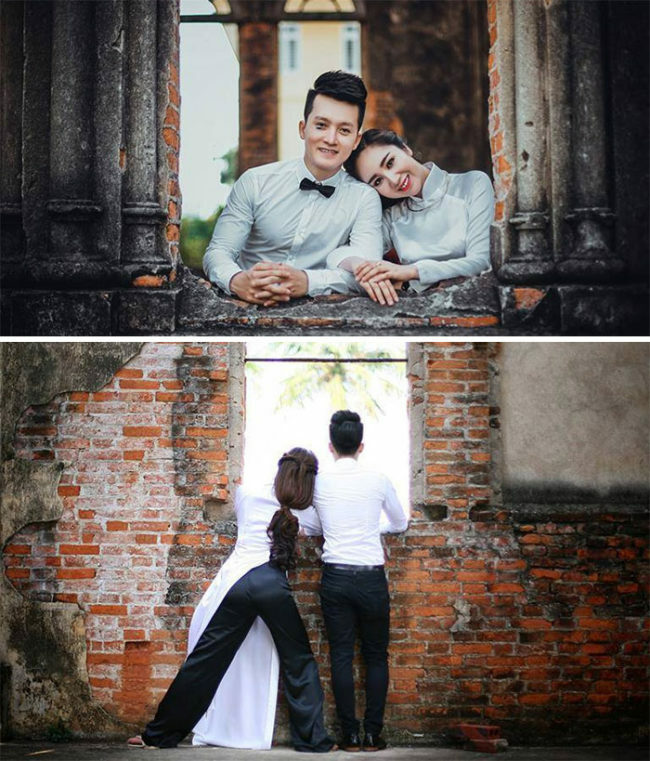 I can tell you now, I do NOT have enough patience to pull off a photo like this. 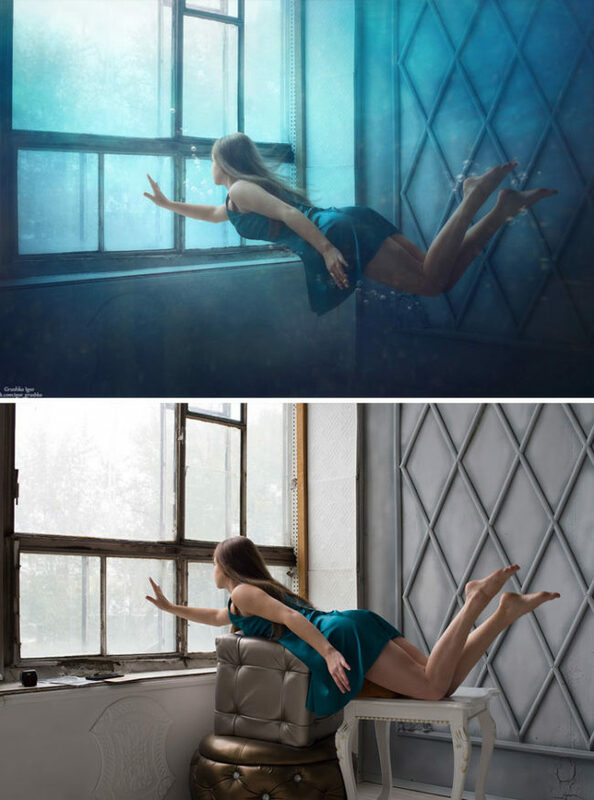 This one is just entirely photoshop, which was obviously from the start. However, I wouldn’t have guessed it was just taken in someone’s apartment with a massive bowl thing. 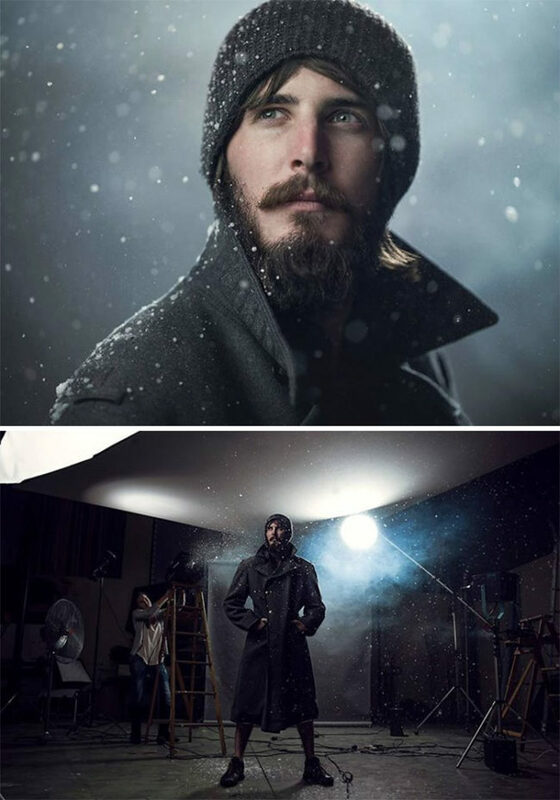 I would never have guessed this is how they took these photos! That is so awesome. This is my favourite. I love how she is stood so awkwardly just to appear shorter than him. It’s dedication, I’ll say that! I would NEVER have guessed that this actually wasn’t real. 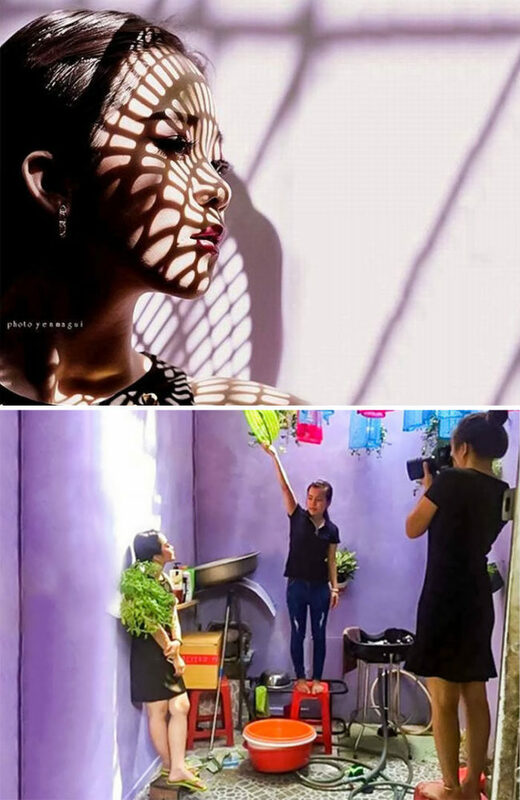 Amazing photography and next level awesome deception! This really is mind-blowing. That fancy perfume you love? 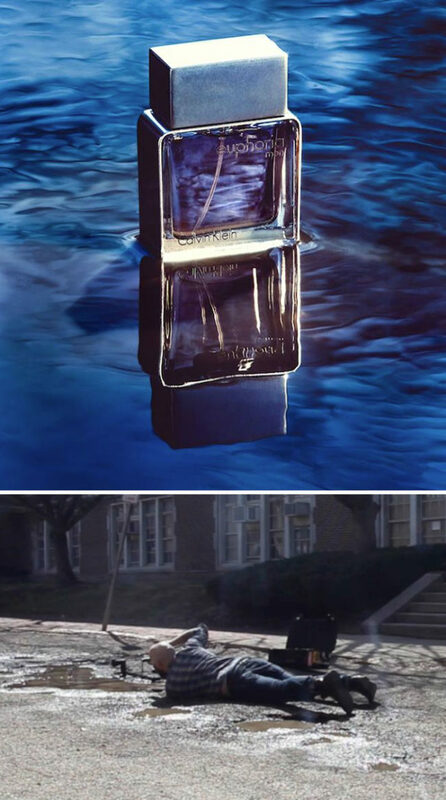 Yeah, it was photographed in a goddamn PUDDLE. HA! This one is so me. I can never afford any holidays so if I wanted to trick people that I ever went away, I would just stand in some dirt and pretend its sand. I live a sad life. They worked with what they had and I can respect that, I really can. 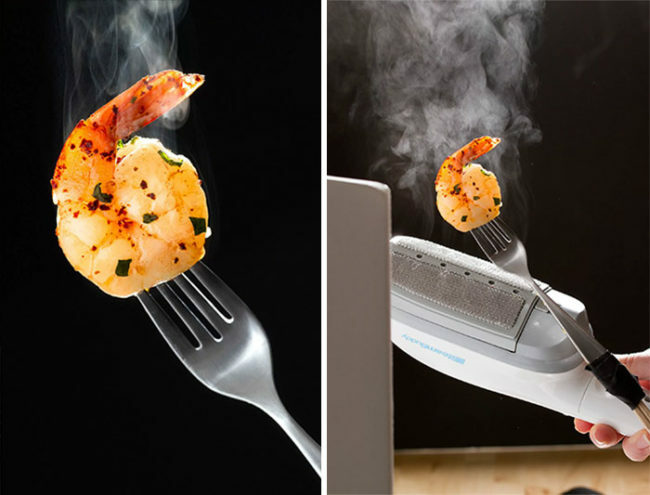 This looks just as good as the real thing, I wouldn’t be mad about it at all! I don’t know why you would WANT rain on a perfectly sunny day but fair enough. At least they had their pal nearby to throw a bucket of water on them instead. After this, I’ve learn that every single photo EVER is a lie and I might as well stop believing everything I see. 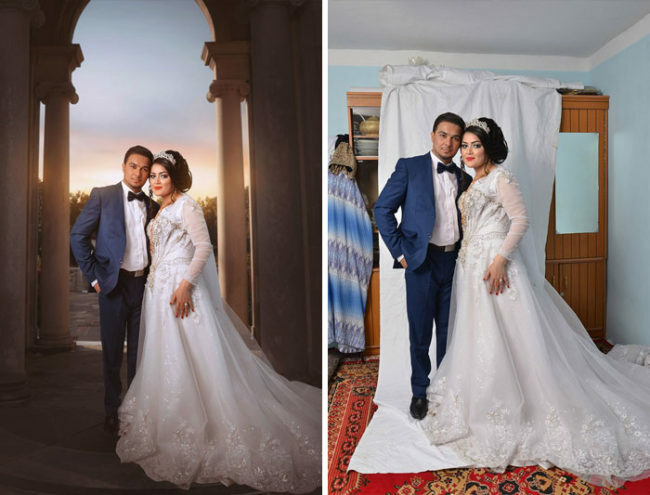 At least I won’t get jealous over Instagram photos anymore!